Aimpoint CompM4 and CompM4s sights both include enhanced ACET technology that provide up to eight years of continuous use from a single AA-size battery. Once turned on, Aimpoint sights stay on — there is no automatic shut-off, so your optic is always ready whenever you need to use it. The CompM4 and CompM4s incorporate an integrated mount that eliminates the need for a separate ring, and can be customized with vertical and forward spacers to fit a variety of weapon systems. All CompM4 sights are shipped complete with a QRP2 mount and standard AR15 spacer. These sights also come equipped with a killFlash anti-reflection device and MILSPEC rubber lens covers. MSRP $850. 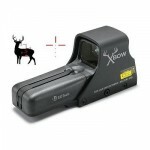 Designed with crossbow hunters in mind, the Model 512 crossbow sight utilizes the unique properties of holography to create optimal range-scaling data in a heads-up display. A precalculated ranging scale is projected on the target and measures the back to the belly of a standard whitetail deer (16 inches). Simply position the base of the scale on the belly and read from where the back intersects the scale — it’s that easy. With the integral ranging pattern, there is no unnecessary body movement or added noise from your tree stand. Both range information and aiming reticle are displayed within the same sight picture to quickly line up your shot. MSRP $489. When looking for the perfect bag that fits all of your needs and requirements, you can’t go wrong with this new Universal Go-To Bag that is built with YOU in mind! Features include a large main compartment with a removable divider, five additional pockets for storage, zippered compartments throughout, fully adjustable shoulder straps and web grip handle. Your options are endless when customizing this bag. Add one of our morale or medic patches to the loop panel on the front and keep your bag unique and visible when needed! For more info, go to www.FoxOutdoor.com. The new Hide ‘N Hunt blind from Hunter’s Specialties is a compact, easy-to-set-up blind that allows hunters to quickly conceal themselves in almost any situation. The hub-style blind is 65 inches tall and 62 inches wide when set up, yet folds into a compact package for easy transportation in the field. The Realtree APG Camo blind features shoot-through, camouflage-netting windows. A zippered triangle door allows for easy access, and two interior mesh storage pockets offer storage space. The Hide ‘N Hunt blind comes with a carry bag, ropes, stakes and complete instructions. Looking for something a little different? How about 36 different color choices for personalized illumination? The 36 Color/IE Scope is based on a 30 mm tube with Emerald Lens Coatings for maximum light transmission and clarity. It also features Leapers True Strength Platform, which includes a nitrogen fill for its shockproof, rainproof and fogproof rating. The innovative EZ-Tap Illumination Enhancing adjustment system with red/green in Dual Color Mode and 36 colors in Multi-Color Mode adjusts in a single click. The Premium Zero lockable turrets offer 1/8 MOA adjustment with parallax adjustments from 10 yards to infinity and Mil-dot Range Estimating Etched Glass Reticle. MSRP $350. Oftentimes you get what you pay for, but on occasion there is a diamond in the rough, and Leapers provides plenty of value for rock-bottom prices. The TF2+ is completely nitrogen filled, shockproof, fogproof and rainproof. The user-friendly and tool-free target turrets feature a two-step operation for zeroing and zero lock operations. Additional highlights include a mil-dot range estimating reticle and one-piece tube construction with angled integral sunshade. MSRP $80.